It's been a while since we've had any good UK related Android Pay news, the last tidbit being the addition of Metro Bank to the service back in February. You may have seen that American Express got Android Pay support in Canada recently, something I was more than a little bit jealous of as I've been waiting to have my Amex on my phone for ages now. Finally, my calls have been answered, and Amex cards now work with Google's mobile payments app here in the UK. I didn't get a notification about this, which I might have expected given my Amex card is set up in my Google account. But nevermind, I'm just glad to have it. When I went to set it up all my details were already in there and I just had to confirm my CVV number to finalize things. 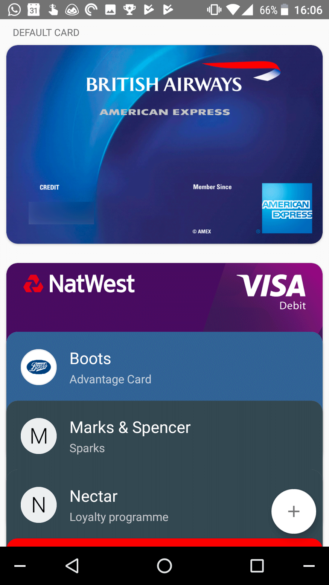 Now I can use my Amex on the Tube or the bus with the convenience of Android Pay on my phone, which I've actually found opens barriers quicker than when using cards, for some reason. If you've also got a compatible Amex card (a personal or small business credit or charge card, or even a corporate card) and you live in the UK, head to the Android Pay app to easily add it and start using it wherever mobile payments are accepted. This means we no longer have to use the proprietary contactless solution through the Amex app. Amex Pay seems like it's a bit finicky to set up and obviously isn't anywhere near as convenient. Now, who do I speak to about getting Monzo added to Android Pay here next?